Congratulations Teresa! Please email: lovesrubberstamps@yahoo.com by April 11th to claim your prize. Before I show you my project for today I wanted to let you know that we will be posting a DESIGN TEAM CALL for our Design Team term that starts May 1st and runs through August 30th. We will have the details and how to try out for the team on our Tuesday April 7th Challenge. You do not need prior design team experience to apply. We would love to have you try out! I don't think it turned out too shabby for the first time I tried this style. I really like how my grass area turned out...I tried something different with the sky and clouds and I am not sure I am really loving that part...but it may still grow on me - LOL! I didn't have any of the colors that Delphine uses in her tutorial so I had to use a mix of my copics and spectrum noir markers for the scene. I was pretty irritated because many of my spectrum noir markers were dried out! Some I had never even used yet and I am not happy about that! I have always kept them in a cool environment with no temperature extremes so I don't know why they are dry. So I was even more limited on my color choices because I had to find markers that worked! GRRRR! For my clouds I am awful at drawing the cloud shapes so I decided to use the cute cloud image in Paper Smooches Forest Whimsy set by stamping just the tops with Memento London Fog ink. It was darker than I wanted it to be so I ended up swirling my white gel pen over it and then blending that with my finger to try and tone it down. I also added clear wink of stella over my clouds for some shimmer. I want to try and find a really pale light gray ink to try this again because I don't want it to be as noticible, but I do love the cloud shapes in this stamp set. 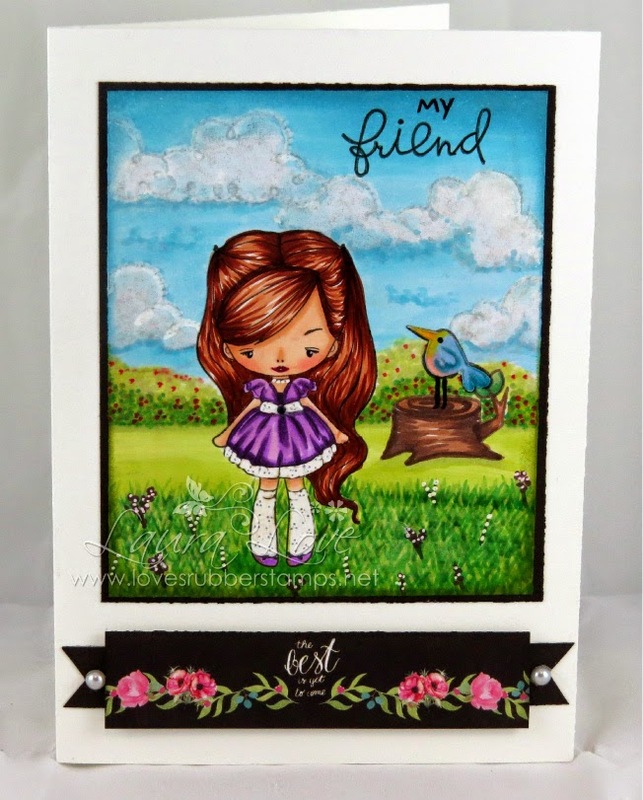 My sentiment panel is created using papers from the Prima Optimist paper pack which I will be listing in the store soon. That sweet little girl is the Blush Babette image from The Greeting Farm. I really love the images from this collection. Thanks for stopping by today and don't forget to mark your calendars to check out our Design team call on Tuesday! Ein sehr schönes Werk. Ganz toll gemacht. Danke daß du bei der Stempelsonne mitmachst. What a sweet and fun little Spring scene! The clouds look awesome. Thanks for joining LLC for our April challenge and Happy Easter! SOOO CUTE!! Love your clouds! I need to try this! Laura, your card is so sweet! All of it is wonderful, but I love the hair on the little girl and your grass is AMAZING! It looks like I could looks like I could put my hand through the screen and touch it. Das sieht so toll aus. Klasse coloriert. Vielen Dank für die Teinlnahme an der Stempelsonnenchallenge. Wow Laura!!! This looks like a lot of work but the background is so amazing! I LOVE this!!! I hope you and the family had a wonderful Easter Holiday! Wow....I think it turned out better than "not too shabby" LOL! It's gorgeous!!! Wonderful coloring, Laura, especially that hair! Thanks so much for playing in our "Anything Goes with a Sentiment" challenge at Aud Sentiments. Hope to see you again in our new challenge which starts later this week. WOWZERS!!!! That 's an AWESOME looking card Laura!!!!! Whoot Whoot!!!! 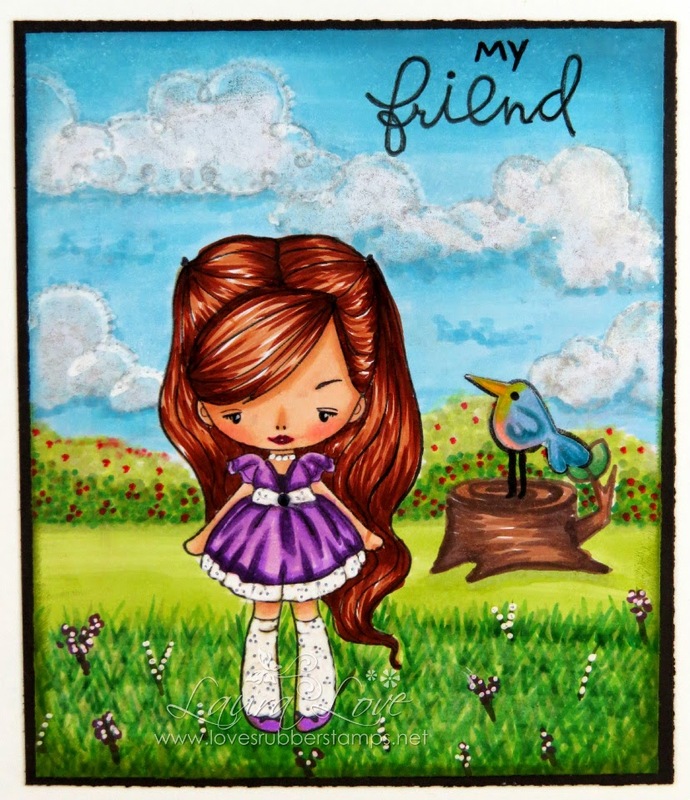 Lovely card with a cute image and great colouring. Thanks for joining us at the Stempelsonnen challenge and a hope too see you again. Wow Laura this turned out beautiful! I LOVE your coloring!!! Thanks for joining us this week in our Funday Friday challenge! OMG, love the entire background you created...love everything you did with it! Makes me think I need to start looking at some tutorials to get some new ideas. What a fab card Laura! Hey, congrats on having this card on the TGF WOW'ed Wednesday this week! i'll say it agsin, what a fab card!